My property is eco friendly, cool inside also when outside is hot: roofs and walls very thermally insulated, no need of air conditioning. High pine trees makes the air very oxygenated and fresh. Pool salt water without adding chemicals. EMERALD HOME has salt water POOL, NATURAL CHLORINE (NON-CHEMICAL), IS A SPLENDID APARTMENT (sleep up to 6 people ). 3 bedrooms: 1 doublebed, 2 with 2 singlebeds. 120 s., 3 terraces : South, North, West. Is part of Villa Sea and Archaeology, QUIET AND CLOSE TO SPLENDID MEDITERRANEAN BEACHES AND AMAZING ARCHAEOLOGICAL SITES. Access FREE INTERNET ADSL WI-FI 24/24 h.
Beautiful outdoor barbecue between trees. Outdoor terraces can be used for barbecue dinners and for sun baths. Villa Sea and Archaeology is a splendid villa close to the sea and to very famous archaeological sites: Third century Greek temple and amphitheatre of Segesta (20 minutes), antique roman town of Selinunte (40 minutes), archaeological site and gorgeus museum of Mozia and Marsala (40 minutes), splendid XI century Norman and Arab monuments of Palermo, XI century Golden Mosaics Norman Cathedral of Monreale, Old Greek Temple Valley of Agrigento. Live this atmosphere enjoying your staying in a new villa surrounded by pine trees, private garage, very large garden (s.m. 3000). Dear guests, My property is eco friendly, cool inside also when outside is hot: roofs and walls very thermally insulated, no need of air conditioning. High pine trees makes the air very oxygenated and fresh. Pool salt water without adding chemicals. My wish is that you enjoy the villa, the swimming pool and its fantastic salt water. The pool that you will be using has a special high technology system (Electrolysis System) producing NATURAL CHLORE straight from salt-water and constantly controlling the degree of water PH. By this, to put the system in conditions to produce the best quality water and to give you the opportunity to get the most pleasant swim, totally exempt by any irritation on eyes, lips and nose that only the Natural Chlorine can offer you, I take care of it daily. The result is a pool water that you have never seen and enjoyed: perfectly clean and transparent, brilliant, soft on you skin. My biggest satisfaction is to hear by my many guests that they have never found a pool water like that and also some of them that own a pool salt water ask me to reveal them my secrets to get this fantastic water ! "Emerald property is clean and tidy with a large balcony and good sized rooms. A very nice property. If you are English and want a kettle then bring a travel kettle with you otherwise there is everything you will need. Emerald villa is on the first floor above the owner Antonio. Antonio was an excellent host providng wine and coffee on the first night when we hadn''t had time to get any. We also had a great meal on our last night with him. Good wine, food and company. The villa is part of 5 situated around a salt water swimming pool which is lovely. Swim caps and proper trunks are required for the pool. You will need a car as it is a km or so from town. It is very well situated for exploring west Sicily as it is a few minutes from the motorway and 20 mins from Palermo airport, although you wouldn''t know it as it is very quiet." "Very clean appartment and a great pool in a quiet area. Only few minutes by car from sandy beaches in Balestrate." "I had an amazing time while staying here! The apartments are very comfortable and clean. In addition the surrounding gardens and pool create a very relaxing atmosphere. I also appreciated the location, only five minutes away from the beach! The owner, and his wife are incredibly kind and welcoming. I would love to come back sometime soon, and recommend it to anyone looking to have a peaceful yet fun vacation." "Being in one of the apartments of Antonio near Balestrate gave us the chance to experience Sicily in a very special way: first of all the apartment was very nice and comfortable, with furniture that are an optimal compromise between traditional and modern, then it is situated in an area, where a lot of things like the Riserva Naturale orientata dello Zingaro, some very nice beaches, Palermo, the ancient cities of Siracusa and so on… can be reached easily and Antonio is also always willing to give you great advice of where to go when – besides he also invited us multiple times to fantastic food, interesting conversations and we always had a helping hand. Also for this was just a short visit of this area I know one thing for sure: we will come back as soon as we can!" "We had a very pleasant time staying in Balestrate. The villa is surrounded my beautiful flowers and trees and it is very peaceful and relaxing. We also visited many of the local places of interest and the beach is about five minutes by car. 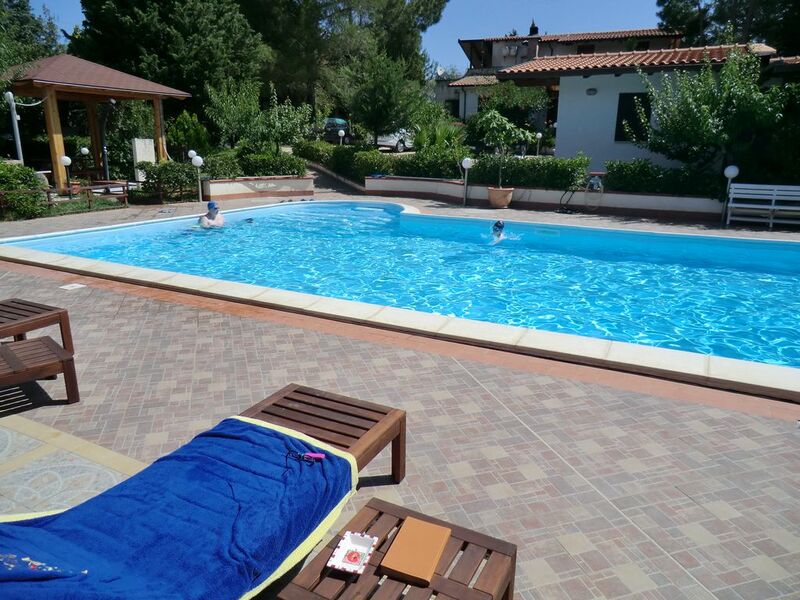 The villa has all the facilities for a self-catering holiday. Antonio was a great Host, very helpful with any queries and cooking for us a delicioius meal made from fresh local produce." Emerald home is a very nice and cosy villa. It has all the facilities you need for cooking and enjoying your holiday. The rooms are very large and the comfortable (with orthopedic beds, long chairs and furniture). The terrace has a superb view. It is close to many sandy beaches and it is also very convenient to get to the famous archaeological sites in Sicily: Segesta, Selinunte, Mozia, Agrigento. I also suggest visiting the medieval village of Erice and the interesting Baglio di Scopello -testimonial of the old rural units in this area of Sicily. Antonio has been an excellent host. SHOWN PRICE IS REFERRED TO 6 PERSONS. ASK FOR MULTI APARTMENTS PRICE IF YOUR GROUP IS COMPOSED OF MORE THAN 10 PERSONS.